SPF's latest beta channel update contains the option to use their new A3 algorithm which according to their benchmarks makes SPF now the fastest publicly available solver in the world (previously Jessolver was leading). 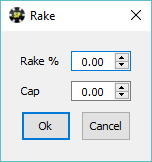 The latest update also contains new features like rake support. Note that you will need to get the Beta update to use the new algorithms which you can do by going to File > Updates and entering the beta channel update path: http://simplepostflop.com/beta_x64/. I tried this out today on some scenarios I have run in the past and the results were impressive. 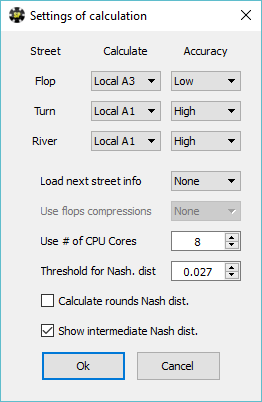 3-bet pot scenarios with 1-2 bet sizes on each street that used to take 30-45 seconds to run can now be solved in ~15 seconds to 0.5% of the pot exploitability on my laptop. CO vs BB single raised pots that used to take ~3 minutes now take ~2 minutes. 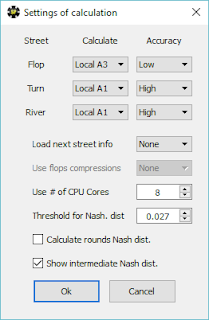 You can choose which algorithm to use in the Standalone > Solver Settings menu (A1 is the old algorithm, A2 is a new algorithm optimized for narrow ranges, and A3 is the new general algorithm) which makes it easy to bench mark the performance improvements. The new version also includes rake support which means that the SB vs BB cash game preflop strategy pack will be updated with new solutions that include rake. It also means you can now experiment with adding rake to your postflop solutions which particularly for lower stakes players can be interesting. You can download the free trial or purchase SPF here: http://simplepostflop.com/en/Buy?source=gtorangebuilder. All GTORB readers get a $70 off discount on the Standalone solver.